From a low point perhaps fifty years ago, otters have been slowly staging a comeback in Contra Costa County. 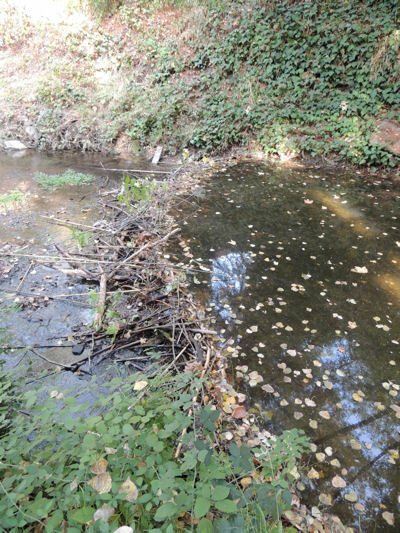 They have gradually recolonized many of our creeks, learning to cope with flood control structures and other unnatural objects as they get around. They can walk cross country to move from one creek to another. Once they find a good spot, they stay until prey (fish and crayfish) becomes hard to find. Then they move on. They have visited Heather Farm Park in Walnut Creek for many years, but recently they have been staying longer, there are more of them, and there has been breeding activity. Otters range as far south as San Ramon now and can be seen in Walnut Creek at Civic Park and in Las Trampas Creek. Much of this renaissance is due to cleaner water. For otters to flourish, they need two things from humans: high quality water and protected wildlife corridors so they can move around. The famous Martinez beavers aren't the only ones in the area. As early as 2009, we saw beaver tooth marks on a tree in Civic Park in Walnut Creek. A year or two later we saw debris in the water that could possibly have been the beginning of a dam. In 2013 this became unmistakable. A number of cottonwoods were girdled. Upstream, trees were felled and a dam begun. It washed out after rather a small storm and the beavers abandoned it. Perhaps the current was too strong, or they concluded there wasn't enough to eat. We never saw this beaver or beavers, but they were likely to be young and inexperienced, expanding into new territory after leaving their parents. We have not seen any signs of beavers since. Beavers are problematical in densely populated areas because they destroy vegetation in order to eat, and they alter stream flow when they build their dams, sometimes even causing floods. On the other hand, beavers are very good at creating habitat. Their dams would be a benefit in the hills, where the ponds they create would provide water for wildlife in the summer, and with it, a greater variety of plant species and new habitat niches to meet wildlife's needs. 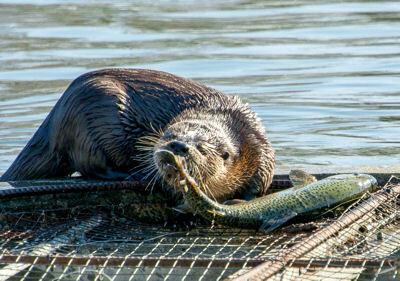 Otter eating a freshly-caught trout in the front pond at Heather Farm Park in Walnut Creek. Two recently installed floating islands have created habitat and improved water quality.